Mary Okeke: So Diane, are you now a writer by profession? Diane Brown: I do consider myself a writer now. 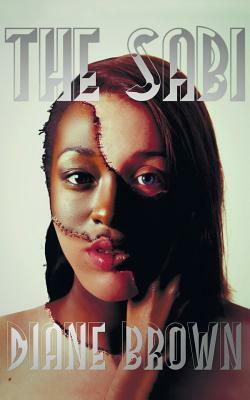 "The Sabi" is my first published book, but I have written two others which will be published in 2014. I also write for an African Women's magazine based in the UK as well as on commission by various media outlets and on line magazines. Writing is what I do on a daily basis now. MO: Interesting. How did you come about writing “The Sabi”? we need to present a 'proper' image when we conducted the research. When our lead consultant made presentations, she would constantly 'correct' his 'accent'. I felt a torrent of pressure build from deep within me and I knew that there was something very wrong with South African society. DB: Yes indeed it was - but this experience was not unique or uncommon. I was shocked of course that someone can have the audacity to say that, and I began to think about where that audacity came from. How was it possible that in post apartheid South Africa a white woman can dare that kind of audacity, in an African country. I began to think that if people like me and my colleagues that have been fortunate to have post graduate education could experience that kind of treatment, what of the millions of other people in South Africa - what chance do they have? Over a period of two weeks I came to a decision that I would stop the three year contract with that parastatal and I would focus on changing the conditions that created that audacity in the first instance, and that I would use writing as a key vehicle to achieving that. DB: Sometimes it is not courage, it is just what you have to do. The second spark came from a research report that indicated that some 30 percent of young South Africans did not think that apartheid was a crime against humanity. That was both shocking and sobering and I wondered what role my generation had played in sweeping hundreds of years of the collective and individual experience under the carpet in search of a rainbow or miracle nation. Then I went to look closer at my son's literature list at school and I realised that we were in trouble - NOT ONE of the authors were African, and even where the story was about South Africa it was written by white authors. It was a time of deep reflection for me, and I realised that I needed to tell my story - not only so that people know what really happened, but also so that young South Africans can understand why they are up against very real glass ceilings when they enter the job market, why violence is so rife in this country and why South Africans are so very angry. At least if we acknowledge the anger and understood where it comes from, we could start to deal with it. The sad reality is that South Africans don’t discuss race and racism openly. It is as if we are so desperate to have the 'dream' that we do not acknowledge what happened in the past and what is happening inside all of us today. I needed to write in a way that shows what happens inside of people in relation to what is happening in the society at large. MO: While we look forward to a very bright future, we shall neither forget our past nor our history. How was the writing process? In my opinion, I think it could be kind of therapeutic. Was it? DB: It was extremely therapeutic and transformative. It allowed me to go deep into my self and tell the story from the inside out. At the same time it also gave me an opportunity to reflect on my life, and I emerged with much more perspective about the condition of the black person and the black woman in the world today. English widely spoken in west Africa. DB: Yes it is! In 2012 a friend from Lagos came to visit me for two months and used the phrase "I sabi, you sabi" so often and I just realised that it was the perfect title for this book. Because this book is essentially a book about a "knowing" or a "sabi" that you get from being born into this kind of society that ultimately influences how you see the world and your own character is formed in response to that knowing. MO: Knowing that you revealed a lot about your family in “The Sabi”, about your father in particular. How did they receive your novel? DB: They are generally happy that I have published because they know it is what I have been wanting to do, but they have not read it yet. I expect that some will not be very happy with the contents of this book. MO: I know and believe that apartheid was over almost twenty years ago. But, did the violence subside with it as well? DB: The violence is still very much a feature of South African society today. Unless we all face what is inside of us, and unless the economic conditions of the majority are met, it will be very difficult to reduce the violence. It is a symptom of a society that is dysfunctional because of our past. MO: What is life like today between blacks, whites and the “coloured” in South Africa, I would like to believe that the racial tension and segregation is over and done with. DB: South Africa is a very divided society. We have been segregated since the 1700s when the British were here and we are still very much separate today. We are very far from a 'rainbow' nation. The hundreds of years of separation, institutionalised oppression and racism has had a real impact on South Africa. It is one of the most unequal societies in the world. The majority of black people have not yet seen real uhuru (freedom). There is no way that you can interfere with the natural order of things and still expect a healthy society. The natural order of South Africa was interfered with for a very long time - it is a violent society. MO: What message do you intend to send with “The Sabi”? DB: First the book is about acceptance. About learning how to accept oneself amid a cacophony of dominant voices and images that constantly portray you as 'less than'. Second, I would like people to acknowledge and understand what institutionalised racism did and still does to people. What its effects are and how it forms people within a society. So the next time anyone says "just get over it" they will think twice because they may have an understanding about the real effects of this system of which we have been burdened with for hundreds of years. MO: I find it quite cruel to tell a victim of racism to “just get over it”. DB: Yes it is very cruel, but we hear it often, and I have realised not only in South Africa but in the USA as well. Although this appears to be my story, it is really not about me. It is the story of South Africa and about the black experience. We are products of our experiences and the societies into which we are born. What happens in our homes is also a product of the system and can not easily be divorced from this. You cannot expect to have violence in the society and not experience it in your home, and vice versa. It is more specifically about the making of the black woman around the world - and that the choices about altering skin tone and hair are not so unique or out of context in relation to the dominant worldview. The feedback from black people in the USA to The Sabi so far, has affirmed this over and over again. DB: Anyone who reads this book will get to reflect on the human condition and its duality. It will further understanding on oppression and on race relations. Fathers who read this book will have a greater understanding of how their children experience them. Girls will get an understanding of why things happen to them and why the pressure to emulate that which is not natural to them. MO: Tell us about the publishing process, was it difficult? DB: Publishing for any new author is a difficult process. But publishing for the black person is very difficult. It is easier to get my book in Europe and the USA than it is to get it in South Africa or the rest of the continent. I wish African governments and businesses could invest in authors, because the story has to be told less by the hunter. Our children should be reading books written by Africans. MO: I totally agree. How long did it take you to write “The Sabi”? MO: Who are the African writers that inspire you? DB: Eskia Mpahlela, Ngugi wa Thiogo, Zakes Mda, Chinua Achebe are way up there for me. MO: Reading any novel at the moment? DB: In my current writing mode I don’t like to read novels, so I am enjoying the poetry of Menzi Maseko but will re-read The In Between World of Vikram Lall from Kenya, and acquire Zakes Mda's new work The Sculptors of Mapungubwe once I have finished this book that I am writing at the moment. MO: How did you come across Mary Okeke Reviews and what do you like most about it? DB: I saw one of the books that you had reviewed on google plus network and visited your blog. I was so excited to see that there was a site dedicated to African authors. I particularly like the range of African authors and books that were covered by your blog. It is a very necessary service for Africa as a whole. Perhaps reading Prof Ngugi's piece on the burden of the African writer will increase your understanding of why a blog like this is so necessary. MO: Thank you. I will definitely lay my hands on that piece of writing. Where can your book be purchased? MO: By the way I like your book cover, quite intriguing, was it your idea? DB: The designer from the publisher designed a few for me to consider and I thought that this one best captured the essence of the book. MO: It did actually. Thank you. Even before I wrote this comment I bought your book. What a wonderful interview and I'm sure I'll be as touched by the book as I was by your interview. Thank you for sharing your story. I too admire your courage, or that drive within you that made you write this book. Nana I am sure she would apreciate it. I look forward to reading your opinion. Diane, it is a pleasure. Joshua, thanks for stopping by. It is important to know our past in order to project a better future. I love love love the book cover and the premise! Will definitely watch out for that. Also very inspiring. Hi Eniola, I am sure you will enjoy the contents too. Inspiring indeed. This was a very good read. I enjoyed this book immensely, it actually taught me things that I did not know about apartheid. I personally recommend this book for men and women alike. My immediate family loved it. it was an enlightening read indeed! thanks for stopping by. In-depth and inspiring interview, Mary. It was a nice one reading about the interview I have learnt so many things from the words from this lady. This is interview, to me, is one of the best. The book, I must lay my hands on. I cannot imagine a writer that can fuse different African culture in one particular book and still come out with something as good. A south African story, with a Nigerian title! Interesting! Thanks, I really appreciate. I am sure you will enjoy the novel. What an interview! I was hoping it wouldnt end. Diane, you are so creative in the sense that you could tell a South African Story with a Nigerian name. What a fusion! Imagine that, huh? Haha, finding a Nigerian name that eventually gets the essence of the book. There was no other term that could capture the idea I was trying to portray in the book but "sabi" certainly did do that. And in any case I am a social activist at heart and know how important it is for different African cultures to understand each other better, so there is less fear and more acceptance that we are all African. Now many more South Africans will know that Nigerian saying..
Absultely Daine, The Sabi captured the essence of the story. Thanks to you for letting me do the interview.